Thread by @shannonrwatts: "This is a letter to the editor of the New York Times from 1984, a few years after MADD was founded. The author is complaining about new drun […]"
This is a letter to the editor of the New York Times from 1984, a few years after MADD was founded. The author is complaining about new drunk driving laws. The similarities to the rhetoric now defending the status quo on gun violence is pretty amazing. * I've been driving drunk for years, and so have lots of people I know, and we never have accidents. * Even if drunk driving laws work, they encroach on our liberty and threaten our lifestyle. * I shouldn't be penalized for people who can't hold their liquor. * The government has no business preemptively telling us we cannot drink and drive. That violates our liberty. You can punish someone after they kill, but not before. * The best solution to drunk driving is getting children drinking early so they know how to do it responsibly. 3. As the brilliant @paranoidbull bull and others @TheBubbleBubble point out the distortion caused by QE, ZIRP and free money created an Everything Bubble. It has now burst. It is a long way down. There is no "Daddy" Federal Reserve to save us. The Central Banks are fucked. 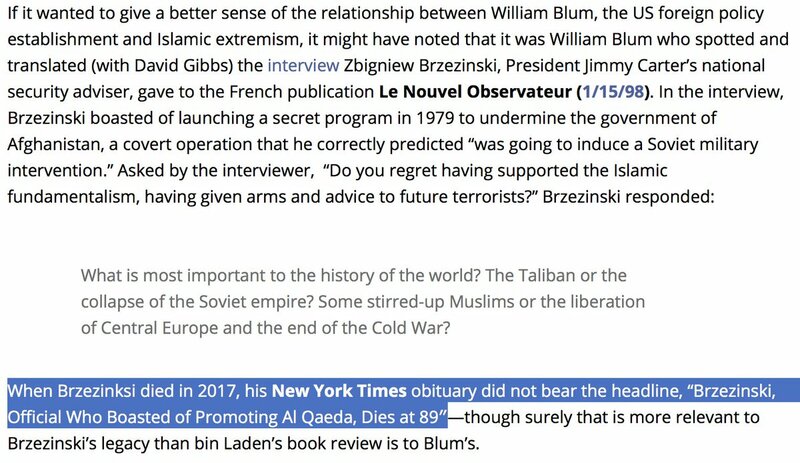 "When Brzezinksi died in 2017, his New York Times obituary did not bear the headline, 'Brzezinski, Official Who Boasted of Promoting Al Qaeda, Dies at 89'"
Let no one say America doesn't have a vigorous free press that presents a wide range of perspectives. 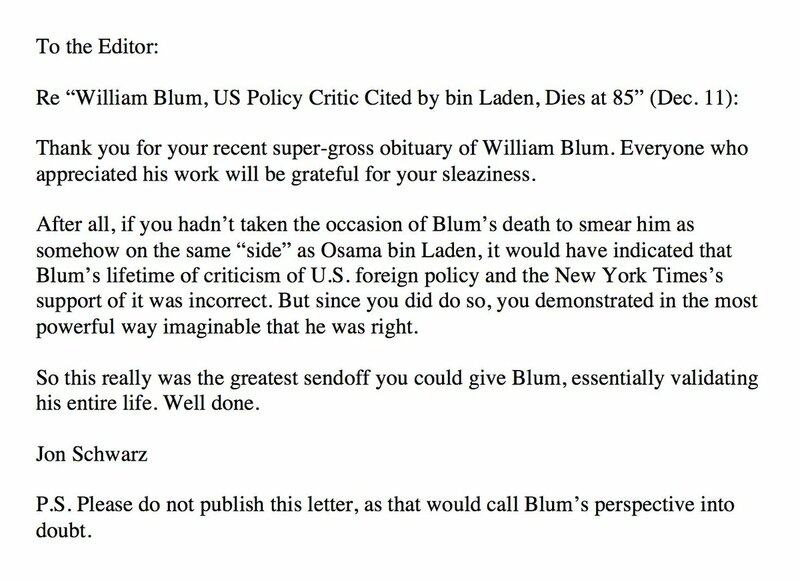 For instance, for their obituaries of William Blum, the New York Times (left) and the Washington Post (right) chose different pictures. I just know this is fake and I don't even want to read it. But here goes nothing I guess. 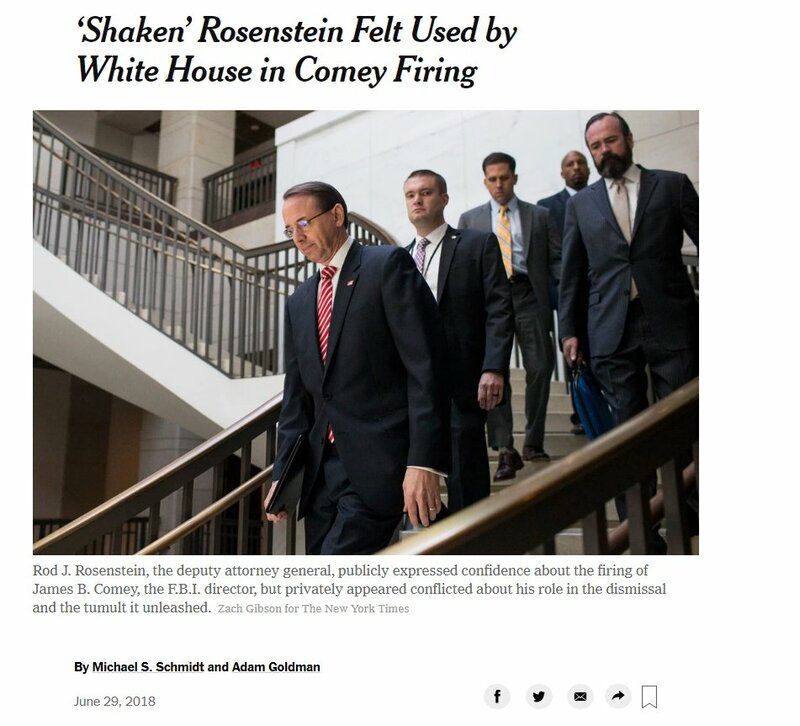 Right away the failing @nytimes tips it's hand and reminds everyone that this was all reported on at length a year ago, and they fail to realize everyone could watch Rod Rosenstein at a hearing in public for hours just this week. 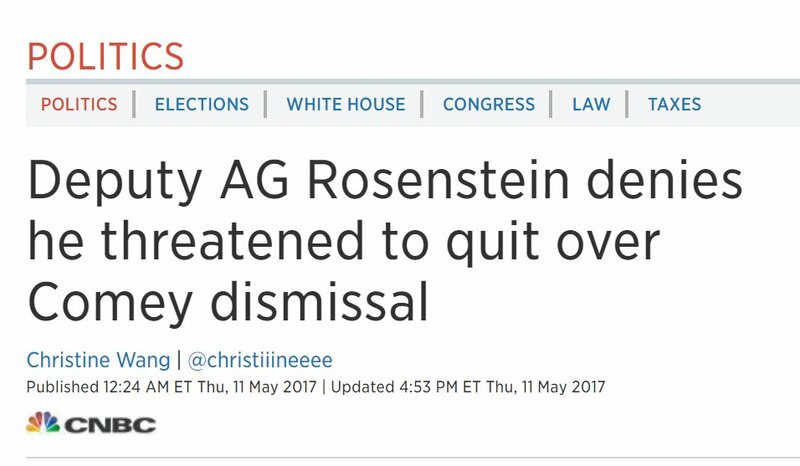 "In public, Mr. Rosenstein has shown no hint that he had second thoughts about his role"
so that's the end right? That's the end here....nope, The New York Times wants to travel back in time again. marsha p johnson denied being the "first" to fight back that night in 1987, saying she arrived at 2am when "the riots had already started"
sylvia rivera said in 2001: "I have been given the credit for throwing the first Molotov cocktail by many historians but I always like to correct it; I threw the second one, I did not throw the first one!" There's a 15-paragraph New York Times article this morning w/the headline "Trump Says Payment to Stormy Daniels did not Violate Campaign Laws". In none of these paragraphs does the NYT even attempt to investigate the question of whether this is true, or what laws apply.